I was reading an article over at Troy Hunts blog about him hitting a personal milestone by getting made redundant and now going full time on creating courses for Pluralsight, and he had a really interesting infographic in his post which was taken from the book the book called “The Future of Work” by Jacob Morgan. 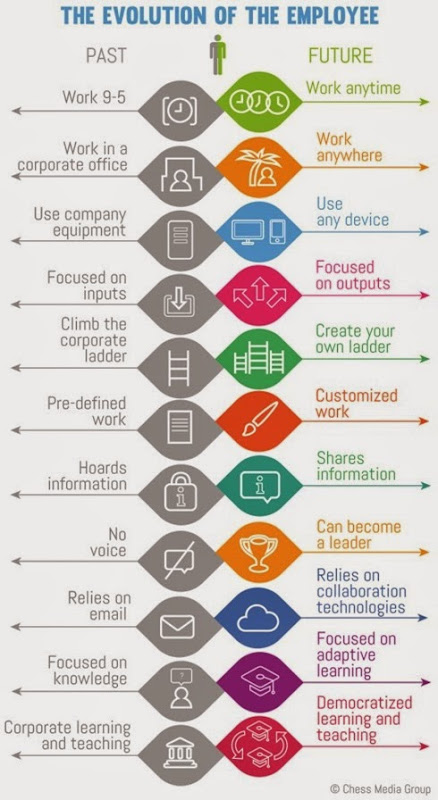 The infographic is about the evolution of the employee and it struck a real chord with me as it aligns with how I have been thinking recently and highlights pretty much everything I have been striving for and want to achieve in the future. I’ll just highlight a few that are really important to me. Works Anywhere / Any time : The focus of my career is changing and for me the ability to work anywhere is really important. I also find I am my most productive when I change my work environment, be it working from home or a coffee shop. Recently in the office I had to give up my desk and start hot desking. Initially I wasn’t too keen on it, but actually I am really liking it. There are many hot desks all over the building and I change where I work frequently. This not only gives a change of scenery, but I meet more people. In another article about retaining software developers, I stated that it is important for a developer to have a desk they call their own, and I still believe this is very important. For my own purposes though, I don’t write code in my current job, so hot desking is more suitable to my needs. As for working any-time. I find the 9-5 grind a little restrictive. I have 2 kids in school and childcare and to help my wife out I have to be flexible with work times. Sometimes this means working a shorter day in the office as I have to both drop off and collect the kids. Even though my employer is OK with this, I always feel a little uncomfortable about it. As for my out off the office work, like Pluralsight courses, I tend to be most productive with them when I work late at night. Focused on Outputs : In the corporate world there are so many meetings, and meetings about meetings that actually getting to an output or deliverable takes forever. This drives me insane and goes against how I like to work. With my Pluralsight work, books, blogging and open source projects, I move very fast. I have an idea and I immediately start working on it, even if it is just capturing notes and ideas. This makes me very productive and with some careful planning with Evernote and Trello, I can maintain a very high output with efficient use of my time. Create your own ladder : I have reached a point in my career where I am not interested in the career ladder. I currently have a good job in a pretty high position, but do I want to go higher, No I don’t. If anything, I would be more tempted to take a step back as this would help me with more opportunity for my Pluralsight courses and books. It has been something I have been putting a lot of thought into recently. Do I focus on my traditional career and rise up through the ranks, or do I use my traditional career as experience to feed material for my courses. I am doing the latter, but it took a lot of soul searching to decide as it potentially introduces personal risk. 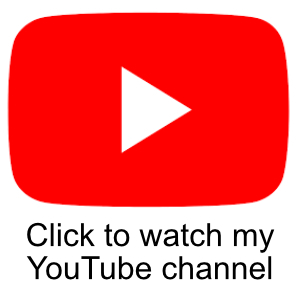 Shares learning and Democratized learning and teaching : I have bunched these 2 together as they go hand in hand but for anyone that has read this blog or watched my courses you will understand why. I love sharing information and teaching people. I never realized I would like this until I started blogging but it kind of becomes addictive, especially when you get positive responses from people. This then fed into creating courses for Pluralsight, and I truly believe this to be the best thing I have ever done. As a customer of theirs for many years before I started working with them, the idea of having access to that much training content for what is not a lot of money, and it really is not a lot of money when you consider an on-site training course will cost you several thousand pounds/dollars, is amazing. These are just a few of my thoughts on the evolution of the workplace above. I actually agree with the whole thing and the book “The Future of Work” by Jacob Morgan is next on my reading list. Where do you fit into this new idea of work? Are you doing these already? Do you aspire work work like this? Let me know in the comments below. Great article, it does ring true as I have seen the movement shown in that infographic in the last couple of years, especially in smaller companies. To touch on the point you said you felt a little uncomfortable about the shorter day in the office, that feeling can lead to people ‘over working’ which is one negative about flexible working. As an example in my last position I ended up working 80 hrs per week at some points solely on a job I was supposed to be doing 38 hrs per week. That was purely as I had to feel I had done enough, or be seen to do have worked enough hours, to justify my flexible working and not being in the office. I am aware this is the fault of the person ‘over working’ and they should have been stronger and in my case I will in future, but it is a trap many can fall into, as not everyone is 100% confident in everything they do and can feel pressure to push too hard. As for creating your own ladder, I have been attempting to do that over the last few years, where the next step is returning to management, but as a senior developer I want to focus more on improving that and expand the role into other areas. The traditional vertical ladder just doesnt work for some people so we need to find other areas to progress to avoid stagnation. Some really good points there Lee. I agree that working away from the team at home can make you feel like you have to prove yourself and it must take a lot of self discipline to maintain an effective work life balance. Yeah thats the exact reason why its important for everyone to have things outside of work that can help maintain that focus 🙂 although can be a catch 22 if people are working too hard to find that in the first place. But I think you are right.